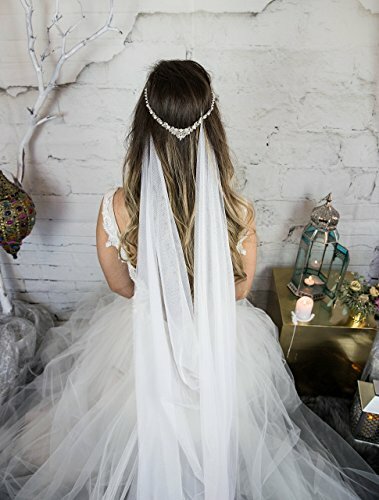 The Dainty Pearl Headpiece is a special edition Bridal Hair Piece. This piece is our bestseller and is sure to add a unique touch to your special day. DETAILS: This headpiece is created with glass stones, rhinestones and pearls. This piece will leave you feeling exotic and elegant. The crystal stones are clear in color. Matching earrings are included in the price. CUSTOM: The Head Piece is attached by two clips which are custom made according to you hair color. Don't forget to note if you need a Blonde, Black or Brown clip. The clips are very sturdy and when clipped in correctly will not come out until needed. STYLING: The Dainty Pearl Floater elegantly hugs the hair and can be worn in the back or the front of the head as a forehead band. HANDMADE: The Dainty Pearl headpiece is handmade in our Winnetka, IL studio. Silver Hair comb with Zodiac Horoscope Astrology Sign "Capricorn"
Silver Hair comb with Zodiac Horoscope Astrology Sign "Cancer"
Silver Hair comb with Zodiac Horoscope Astrology Sign "Pisces"
Silver Hair comb with Zodiac Horoscope Astrology Sign "Sagittarius"
Silver Hair comb with Zodiac Horoscope Astrology Sign "Libra"
Silver Hair comb with Zodiac Horoscope Astrology Sign "Aquarius"
Silver Hair comb with Zodiac Horoscope Astrology Sign "Gemini"